Building on the already planned Venucia E30 for China, Nissan is showing a second electric car for the Chinese market, following Carlos Ghosn's recent statements that China will lead the world in electric car adoption. The last couple months Nissan CEO Carlos Ghosn has talked glowingly of Nissan's prospects for selling electric cars in China. This week at the Shanghai Auto Show, Venucia, Nissan's joint venture in China with Dongfeng, unveiled a concept electric car whose design carries tinges of the Nissan Leaf and Chevy Spark. The Venucia Viwa, as the car is called, shares technology with the Nissan Leaf. However, Nissan is tight-lipped on just how much is shared, whether the drive train has the same specifications as the Leaf, and just what the capabilities of the Viwa are. We can see from the pictures that it's a four-door car, almost certainly five seater, with a smallish cargo area behind the hatchback. Curiously, Nissan's press release says that the Viwa is being developed "following the direction of China's new energy vehicle policy," meaning that the Chinese government is telling Venucia to build this car. For its part, Dongfeng Nissan Passenger Vehicle Company (the parent of Venucia) says the electric vehicles under the Venucia brand will have these attributes: Reliable: Equipped with the most advanced and reliable EV technologies for the Chinese market based on the globally proven technologies of Nissan Motor Co., Ltd. Practical: Packaged with a compact body for easy driving; Efficient: Possessing a driving range which meets the daily requirements of Chinese customers; Accessible: Marketed as a car for daily use which consumers can enjoy while contributing to a more sustainable society. And, the press release did say "will develop electric vehicles under the VENUCIA badge" meaning that there will be more than one electric vehicle, on sale in China, under this brand, derived from Nissan's electric vehicle expertise. 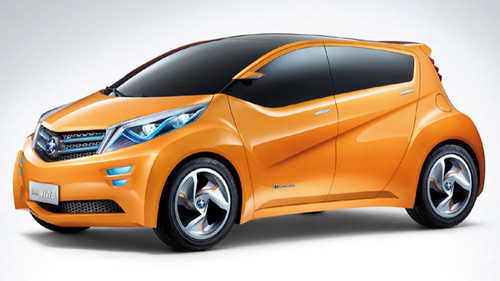 Venucia is on track to launch production of the E30 electric car, essentially a rebadged Nissan Leaf, starting in 2014. The Viwa or any other electric car from Venucia would launch in 2015 at the earliest. In March, at a Renault ZOE launch event in Portugal, Ghosn talked about the importance of China to the future of electric vehicles. At that event he said China has plans underway to be producing 2 million electric cars a year by 2020, and that the government is organized in a manner where they can dictate electric vehicle adoption in a way that other countries cannot. “Environmental protection is the key to the future success for every car company," said Ren Yong, deputy managing director of DFL-PV. “We will continue our efforts to improve fuel economy of our gasoline engines and promote the commercialization of new energy vehicles. VENUCIA unveiled its first-ever mass-produced EV, the e30, at the China (Guangzhou) International Automobile Exhibition last November. To reaffirm our contribution to realizing a sustainable society, we will kick-off the e30 EV pilot program in Guangzhou and Dalian this year."